TAPA Room 210: Satire: How to get the world to pay attention to you. Satire: How to get the world to pay attention to you. There are dozens of initiatives President Obama could undertake to strengthen our economic security. 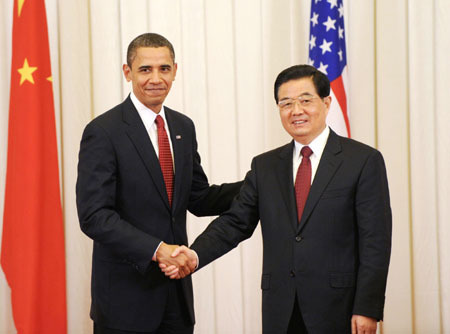 Here is one: He should enter into closed-door negotiations with Chinese leaders to write off the $1.14 trillion of American debt currently held by China in exchange for a deal to end American military assistance and arms sales to Taiwan and terminate the current United States-Taiwan defense arrangement by 2015 …. Today, America has little strategic interest in Taiwan, which is gradually integrating with China economically by investing in and forming joint ventures with mainland Chinese firms. The island’s absorption into mainland China is inevitable …. There will be “China hawks” who denounce any deal on Taiwan as American capitulation, but their fear of a Red China menacing Asia is anachronistic. Portraying the United States as a democratic Athens threatened by China’s autocratic Sparta makes for sensational imagery, but nothing could be further from reality. Question: How do you feel about this? Does it matter if the United States is there to help "protect" Taiwan? Does Taiwan need protecting? What's so bad about China "taking care"of Taiwan, anyways? Ok, so I realize that asking those types of questions in Taipei is grounds for dismissal, if not a punch in the head. However, please believe me when I say I'm not in favor of Beijing—I'm quoting some interesting satire written about a current event. A satire is a literary work that attacks or pokes fun at vices, abuses, stupidity, and/or any other fault or imperfection. Satire may make the reader laugh at, or feel disgust for, the person or thing satirized. Impishly or sardonically, it criticizes someone or something, using wit and clever wording—and sometimes makes outrageous assertions or claims. The main purpose of a satire is to spur readers to remedy the problem under discussion. The main weapon of the satirist is verbal irony, a figure of speech in which words are used to ridicule a person or thing by conveying a meaning that is the opposite of what the words say. One of the true masters of satire is my buddy, Stephen Colbert. Here, he makes a convincing argument that the best way to take care of endangered animals is to put them on a plate. Today for class, we're going to read Jonathan Swift's "A Modest Proposal," the satire from which all satire seems to have generated. As you read, please understand that this is all done tongue-in-cheek, and that Swift is really representing the Irish Catholics, not the English Protestants. You must pick a real/major political/social issue in the world (e.g. drugs, murder, the environment). Paragraph 2 [short paragraph]—"I now will humbly propose my solution..." You give your idea of how to fix the problem. It may be a real solution, but it'd be more interesting if you gave us a crazy, ironic-flavored solution to the problem. Tell us that this will take care of your issue in 3 ways. Paragraph 5—"Disarming." Here, you acknowledge why people might have a problem with your solution, but then you attack their attack. Brilliant. Paragraph 6—Conclusion. Make us feel happy about why your possibly idiotic reason is the only reason out there. Have a first draft by next class!